Welcome to a Ship Buyer’s & Concept Guide, the Drake Dragonfly is on Concept Sale until Monday 27th June. What’s Available in the Sale? 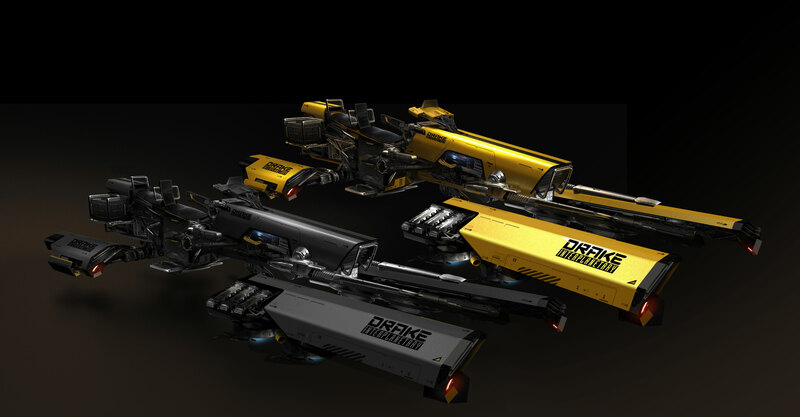 Upgrades are available during the Concept Sale to the Dragonfly Black, Yellowjacket & The Caterpillar too. The Dragonfly is a “parasite” Hoverbike capable of spaceflight and ground travel. It doesn’t have the ability to traverse from space to ground and vicea verse & require a parent ship to travel to and from planets & travel long distances as it doesn’t have a Quantum or Jump Drive & can’t fit them either. It’s supposed to be an inexpensive, space motorcycle. For Pirates & Biker Gangs, raids, exploring, personal transport it has so much utility. Fast & agile enough to be heroic but maybe a little dangerous. The Dragonfly is already being worked on in engine so it won’t be too long before we see it in game. The Dragonfly is termed an Ultra-light Craft for Space & Ground. The Passenger is back to back with the pilot giving them a rear facing arc, they can use their FPS Weapons. This will be the same size as other vehicles like the greycat and rovers. I am assuming that all of these are literally the smallest a ship component can be. And although the shield DOES form a bubble around the bike and both riders it is extremely exposed. I expect these are actually Size 1 guns from the current system, I don’t see why they would need to refactor weapons for Vehicles and as such I believe it’s just the other components. Any Speed is coming from how light this craft is, I don’t expect it to be that fast when fully laden, I think we will see huge differences in speed with the Dragonfly with choice of components & having a passenger. I do expect it to be quite agile and the smallest target in the Verse.. It’s going to be hard to hit even for skilled pilots & those riders DON’T WANT TO BE HIT. On planet the Dragonfly is land bound, it can’t fly around like it can in space. Dragonfly won’t be an atmospheric flight craft so it will need to be carried from space to ground and vicea versa. It will be constrained to hovering just above the Ground & I am not sure if it will be able to go over cravasses and water, but I am sure we will find out later next week. For me it’s main role on the ground would be exploration, it’s a very useful ship for a lot of roles. 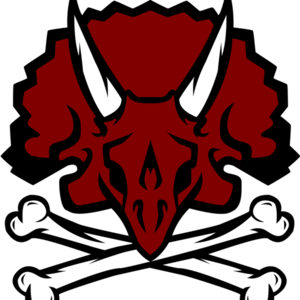 I expect we might see them used a lot in raids and light combat on planets too… maybe for killing the native wildlife as well. Precision Exploration – I imagine these on Orion’s scouting Asteroid fields for Ore and Pirates. In-fact in any tight situation with wrecks or asteroids they would be useful. Swarms, big agile swarms of these are going to make them pretty powerful. A Decent number will fit into a Caterpillar, they haven’t decided the hard limit. 2 or more per module so at least 8! 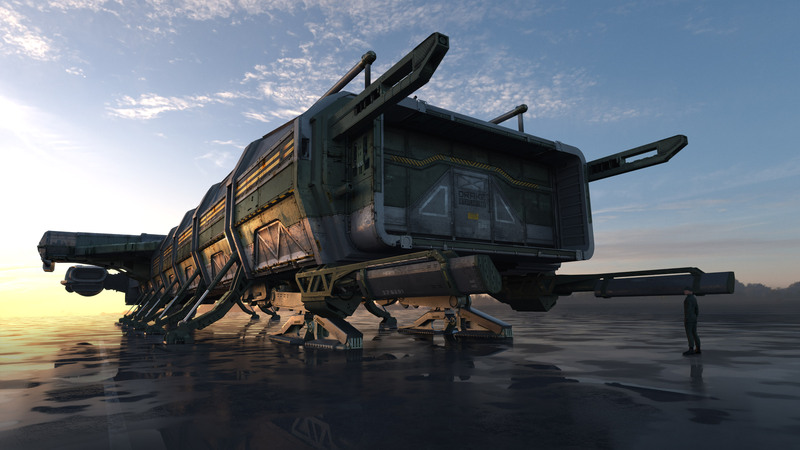 But the Dragonfly isn’t exclusively for Drake ships & many ships will be able fit them, it really is super small when packed up so it will be able to be put in a Freelancer for example, it may be able to be crated up for storage too but they haven’t decided one that yet. They specifically listed that it can’t currently fit in an Avenger or Reliant but CAN in a Freelancer. It does NOT have a Quantum Drive or Jump Drive NOR CAN IT FIT THEM and requires a parent ship to ferry it distances or to & from planets. So it’s not suitable as the only ship on your account really. These are intended for Utility OR very light combat, but will work very well in a swarm or as escorts. Having a 2nd rider being able to fire his handheld weapons is pretty damn awesome, they are not going to do much to a ship but might give you an edge, or maybe you can strafe stations and capital ships targeting marines. The craft is useful for sooo many situations & I would expect every player to eventually have one. It’s Space & Ground capable so that makes it pretty unique. It’s comparison in space is a P52 Merlin or the P72. So the ship has value for a variety of reasons. You can use it as an LTI chip then upgrade it later for a ship you want to get LTI on your chosen upgrade. A lot of people have a Game Package with an Aurora or Mustang on it AS well as another ship or sometimes a fleet. This give s a cheap upgrade for what would be for some a useless ship. Now they can get a bike to put in their Freelancer. The Yellowjackets are limited edition and are likely to be worth a lot of UEC in a few years. Great as a 2nd ship or snubfighter to go into another ship or even a racer. There are two images of the Dragonfly out right now, one in Yellow one in Black. The yellow one (Yellowjacket) is the ‘launch exclusive’ pre-order version & won’t be offered again, they may be a few to purchase in verse in game BUT as limited edition. Limited to the Concept sale. It’s in “lore” the first run that Drake are doing. The standard production Black is the black matte version. Loaner for the Dragonfly should be the P52 Merlin until it’s ready. They have talked about 16 colors they experimented with AND it’s a possibility that we’re get them in the future too, but who knows? They are unsure if a Dragonfly will fit in a Cutlass at the moment, tho I expect it’s something they are considering. It doesn’t matter what upgrade you apply, if the BASE PACKAGE does not have LTI you cannot get LTI with that Package. Upgrades keep the insurance level (and contents) of the package it was upgraded from ONLY the ship changes. Conversely you can upgrade an LTI Dragonfly (Or any package you have that HAS LTI) to anything else and it will keep the LTI Status of the base package along with any extras, hangars, flair, included modules. The Yellowjackets are LTD edition and won’t be on Ship sale again BUT may be purchasable in game though they will be Rare/LTD. The Caterpillar has grown to 100m+ in size, the ship has evolved from it original 66.5m “Evil Freelancer” Origins. It’s as close to a Drake Corvette as we are going to get at least before the game goes LIVE. This might be the last time we can get one before it’s hangar ready & be aware ships normally go up in price once they are moved to the Ready Phase. The Caterpillar has a bit more synergy with the Dragonfly, it’s become a True Pocket-Carrier. With the Ability to quickly scramble 8 or more Dragonflies. It has 4 interchangeable modules, you’ll be able to swap in and out. The Caterpillars we are currently available (and have been purchased) are the “cargo” variant and come with 4 cargo modules but they will add more modules for us to purchase in the future. I went into Drake Salesman mode again there. Checkout the Drake Dragonfly Brochure… it’s is extremely artful. I want a physical one SOOO BADLY. And that’s it for the Drake Dragonfly and I suppose Caterpillar Sale tho I will get a more in depth video on that Cat asap. We will be getting some FAQs Answered about the Dragonfly and I expect the Caterpillar to by Friday 24th June. Remember you don’t need to purchase ships other than a starter package the Dragonfly. Caterpillar and all other ships will be obtainable in Verse when the game goes live you don’t need to spend your IRL monies on them & pledging is a way of supporting the game above and beyond.